Oh Mark, you card. You think we can control ourselves? We’re puppies and Star Wars: Episode VII is a steak. We can’t say no! Im good at keeping secrets. Especially when the goal it to maximize the enjoyment of the audience. That’s why I’m worried about episode 7, they’re going after casting sheets! I’m someone who doesn’t want to know what I’m getting for my birthday. My sisters would go through the closets at xmas, and i hated that. Im trying to keep the surprises for the movies, not for the internet. I hate spoilers, I like being surprised. There’s a natural curiosity, and a competition to see who can reveal the most. I beg people, please lets keep it a surprise! Don’t you want to be surprised? I know I do. I never felt like spoilers actually spoiled anything in Star Wars, myself. There’s a billion ways to imagine “a farm boy, an old man, a hairy creature, and a pirate rescue a princess in a floating ball in space.” Hearing about it and seeing are two different things. 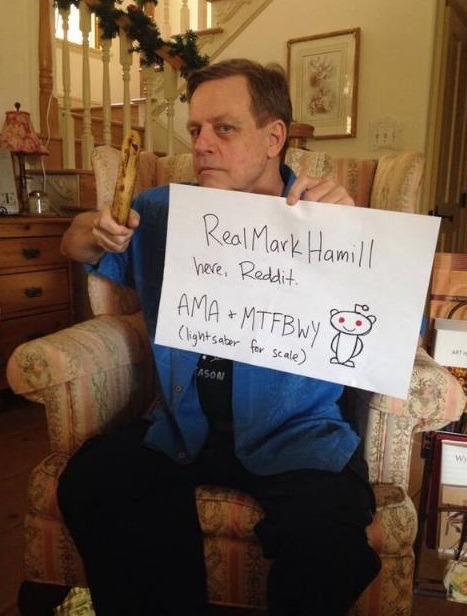 But I think Hamill’s plea comes from a good place. But being a spoiler hound for the prequels really let me understand how my imagination interprets information differently than what we saw on screen many months later. The only character I know for sure is returning is my friend R2-D2. He hasn’t stopped beeping about it. Well based on what has gone before, I have a feeling it’s beard, but I have no confirmation of that. My wife said if you grow a beard, you’ll cover up your cleft chin. That’s not something that occurred to me. But I can only guess. I’ve never read any of the novelizations or anything but someone said to me, ‘you’re married, you have children.’ Based on Obi-Wan I would have guessed I’d be living in an igloo or something. He was more spiritual, he didn’t have a wife or children. And when you find out one of the only eligible women in the galaxy is your sister, it really cuts down on your odds of hooking up with anyone. But that’s not what these movies are about. The charm of the trilogy is it appeals to the child in all of us. It goes back to playing in your backyard. It’s very primal, it’s good versus evil, a high sense of adventure. Haha. I’m not being coy, really. When I find something out, I’ll let everybody know. But nothing has been decided yet.